J.R.R. 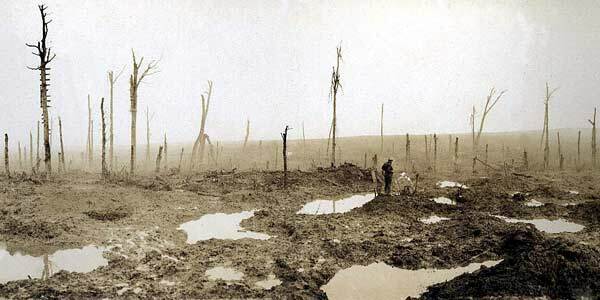 Tolkien’s experiences in World War I, particularly at The Battle of the Somme, would later greatly influence his writings about Middle-Earth. Indeed, it is hard to look at the photograph above and not be reminded of The Dead Marshes. After the worst vacation imaginable in the The Hills of Emyn Muil, I had hoped to return home to the Carrock. Alas no, it seems I must now go to the Dead Marshes (a name that is sadly all too apt) and babysit some pitiful creature named Gollum. Gandalf has asked me to hunt down this cretin, and when a wizard asks you for a favor, it does well to heed them. 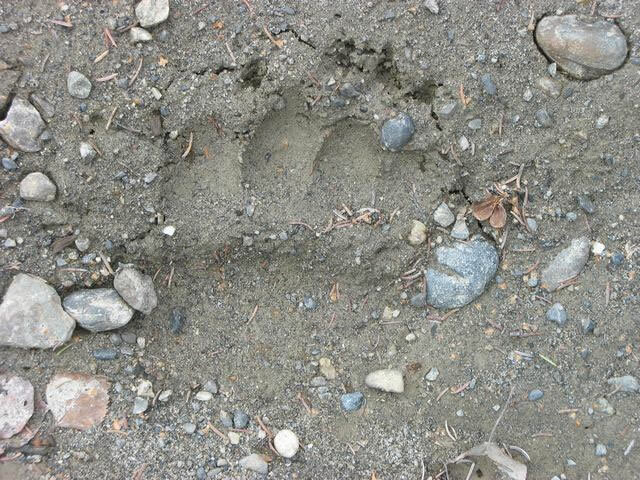 Throughout our journey along Beorn’s Path, we have been incrementally evolving our deck. It is now high time we took stock of our main Leadership/Lore deck and rebuilt it from the ground up. The scenarios have becoming increasingly unorthodox, with requirements that exceed the original design of our deck. While it would be nice to have one static deck to us for all scenarios, because we are limiting ourselves to cards that are contemporary to the scenarios we play, this simply is not possible. Living Card Games have an inherent balance, new scenarios present different challenges, one that often require the use of new player cards. While we want to rebuild the player cards in the deck, we are going to stick with the same heroes. The synergy between Aragorn and Theodred is undeniable, and the action advantage that we get from the ranger has saved us from more than one deadly encounter. Denethor is still the best defender for his cost, and while card draw from Beravor might seem appealing, she would bring our starting threat to a precarious 31. Lastly, but as important, Denethor’s scrying ability remains the only solution available in these spheres for avoiding many of the nasty treacheries in the Shadows of Mirkwood scenarios. So while we are keeping the heroes as they are, the rest of the player deck is up for grabs. To simplify this task, first we will make a list of the indispensable cards, cards that we have learned to rely on throughout our journeys. To make it easier to understand the deck’s overall design, let’s break these essential cards into categories: resource generation, card drawing, questing, combat, grunts, heavies, location-control, healing and miscellaneous. 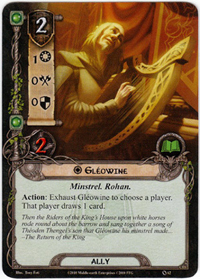 Steward of Gondor remains the gold standard of resource generation. While the Song cards and the Minstrels used to fetch them, technically don’t generate resources, the smoothing that they provide is very important for a multi-sphere deck. One of the the worst situations in this game is having a bunch of great cards in your hand and no resources to pay for them. 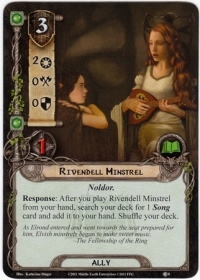 The great thing about the Rivendell Minstrel, in particular, is that once you bring it into play and fetch whichever song is most useful, it can then be used a great addition to your questing effects. This will often mean that you can hold back your grunts for other, more important matters, such as dealing with engaged enemies in combat. Gleowine is an absolute bargain at 2 resources for repeatable card draw. Valiant Sacrifice and Campfire Tales are decidedly less efficient, but at the point in the Shadows of Mirkwood cycle, better forms of card draw simply aren’t available. Campfire Tales in particular, is better suited for multi-player games, but here is just acts as a way to shrink the effective size of our deck, making it easier to get to the cards that we need. Like many of the best allies, Gleowine is actually quite versatile. With 2 hit points, he is less susceptible to treacheries, and can thus be used during the planning phase with less risk. In cases were card drawing is not needed, say Gandalf has provided us with a bounty of cards in hand, we can always send the minstrel along to the quest. As we’ve seen in our travels on Beorn’s Path, particularly of late, questing aggressively is often the best way to survive the more dangerous scenarios. Faramir, combined with some grunts, will always be the best way to solve this particular problem. Additionally, because of his ability, Aragorn is a great candidate for willpower boosting, since we want to send him to the quest every round. Celebrían’s Stone, Protector of Lórien and Dúnedain Quest are all great choices to attach to Aragorn. The last of these attachments even provides extra utility, as it can be used for to boost a hero’s willpower during the quest phase, then used again to boost their defense during combat. While it would be nice to avoid combat, that is not always possible. Aragorn more often than not, is sufficient to handle most of the smaller enemies. Occasionally, we will be faced with a challenge too big for one character to overcome by themselves. This is where these attachments come in handy. Being able to boost Aragorn’s attack will help him penetrate the defenses of even the hardiest foes. On the other side of combat, Denethor, Gildor and Haldir are all greatly improved as defenders by not having to worry about shadow cards. A Burning Brand on any of these characters will make combat much less of a risky proposition. Lastly, Forest Snare can bail us out in the rare times we encounter an enemy that is simply too powerful to risk facing. Every army needs their cannon fodder. These are the unheralded, often forgotten front-line troops that get most of the dirty work done. Whether they are asked to help out with the quest, step in front of an unanticipated attack, or help overcome a tough enemy, these allies are up for whatever task we might need. While their stats and abilities might not seem amazing, the fact that they are inexpensive is very important, particularly in the early game when we don’t have a lot of resources at our disposal. Individually the presence of a grunt does not make much of a difference, but with an army of them in play, global effects like Faramir’s ability, or Grim Resolve, suddenly become much more powerful. When the going gets tough, it’s always nice to have powerful allies on your side. While these guys are all expensive, they are more than worth the cost to play them. Thanks to tricks like Sneak Attack, it is also possible to get them into play, at least temporarily, without paying their full cost. With great all-around stats, each of these characters can help in various ways. Gandalf in particular is the epitome of versatility, and remains this deck’s only means for lowering our threat. Gildor Inglorion’s ability qualifies as form of card draw, but his stats are so good that you will more often use him for questing or to help defending the tougher enemies. Haldir remains one the best all-around allies, with abilities that make him useful in almost any situation. Locations can be a real weakness for this deck. With relatively low starting threat, and limited means for lowering our threat, a stating area filled with locations can be a death sentence. 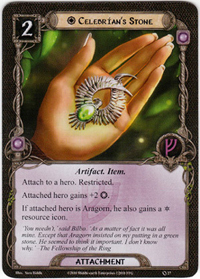 While none of these cards is particularly powerful, their presence in the deck is essential to stem the tide of location-lock and buy us time to get cards like Faramir and Gandalf, that can help us clear a path through all of the locations. 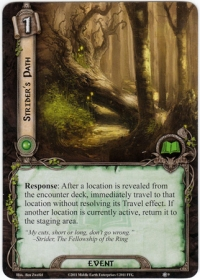 Strider’s Path, in particular, is an important addition to the deck, as it allows us to basically ignore a high-threat location that has just been revealed from the encounter deck. While this diminishes our questing efforts for the round, it is almost always worth it to keep the staging area clean and avoid unwanted travel effects. Not a lot to say about our lovely Silvan friends. They remain the best way, at this point of the game, of keeping our heroes alive and well. While they cannot heal allies, most of our allies are not acting as blockers, and the critical characters like Faramir and the heavies, all have enough hit points to survive a few direct-damage treacheries. Lore will gain more efficient healing cards, later in the game, but for now the Daughters are the right call. As an added bonus, the Daughters do posses the ability to quest. They are fragile, with only a single hit point, so it is best to save this for when you have scried the encounter deck, or in cases of emergency. As our only means of healing damage, we want to keep these elves out of harm’s way, as much as possible. These cards represent the odds and ends of the deck, but are nonetheless very important to our survival. 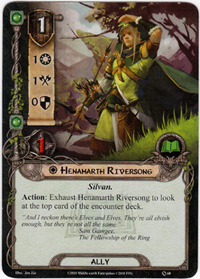 One of the best allies in the game, for his cost, Henamarth Riversong can be used as a grunt, if needed. Where he really excels however, is working in concert with Denethor. 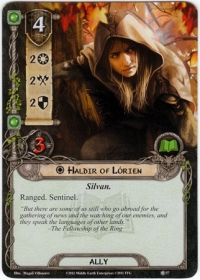 Because he allows us to scry the top of the encounter deck, we can use him to get an idea of whether or not we even need Denethor, or whether the Steward can be better used as a defender. Henamarth greatly improves our ability to plan for questing effectively, but also our ability to maximize the usefulness of each of our heroes. Sneak attack is an inexpensive and very powerful card. With some more expensive allies in our deck, this card ensures that we will be able to call for help, even when we’re low on resources. Combined we Gandalf, we can get multiple powerful effects in consecutive rounds. It is no surprise that this card can often push us through whatever last resistance the encounter deck has constructed for us. Grim Resolve is a one-off card that has been added to take advantage of this deck’s ability to generate a massive number of resources. Between Steward of Gondor and Theodred, it is possible to have a huge surplus of resources by the end of the game. If Gandalf shows up, we will have a great use for these extra resources, but the wizard is fickle and does not always make an appearance. The great this about this card, is that it is most useful in the late game, when we will have the resources to pay for it. More importantly, it is very effective no matter what characters we have in play. We can use Faramir twice, to push through questing, or use Gildor’s ability to find then best card from the top of our deck, then still quest with him. We can even defend and counter-attack with versatile fighters like Haldir. The potential uses for Grim Resolve in this deck are nearly endless. The completed deck can be found on the Decks page. Our opening hand hold some real promise, with Henamarth Riversong, Gleowine, Steward of Gondor, Guard of the Citadel, Erebor Hammersmith and Sneak Attack comprising probably the six best cards this deck has ever drawn. Having the two effects, resource generation and card drawing, that form our engine, means that everything else should fall into place. This scenario has some particularly nasty effects, and the escape tests will mean that we want to get lots of willpower into play quickly, but our opening hand should provide us the means to do this. 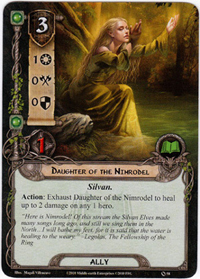 The next cards that we will be looking for, in no particular order, are Faramir, Celebrian’s Stone, and Gandalf. For setup, we give Gollum a time-out in the staging area. If he throws any tantrums, this scenario is going to be a lot harder. 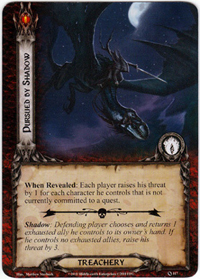 Next, we reveal one card from the encounter deck, in this case Pursued by Shadow. Unfortunately, we have no one committed to the quest, so our threat is immediately raised to 31. With that unpleasantness out of the way, are are ready for the first round of the game. For our first turn, we add our resources and draw Campfire Tales. Card drawing is good, and while this effect is pretty weak in solo play, it will help make our deck smaller so that we can get to the critical cards more quickly. For planning we will spend our two Leadership resources to attach Steward of Gondor to Denethor. We then trigger Steward of Gondor immediately and play Gleowine and Henamarth Riversong. The Silvan’s scrying ability should compliment Denethor’s and help us to be a bit more proactive in avoiding Gollum’s hissy fits. Questing is essential until we get more allies out, so Gleowine will be helping out here, at least for the early game. We commit Aragorn, Theodred and Gleowine, using the resource from Theodred to ready Aragorn. Henamarth is being held back because his scrying ability can help us plan for the hide test that we have to make at the end of the quest phase. For staging we reveal Through the Mist, which means we have to make an escape test using attack instead of willpower. While Aragorn is ready, we want to save him for Gollum’s forced escape test at the end of the phase. So we will send Henamarth and hope for the best. 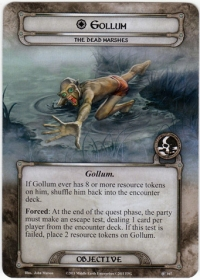 With two cards being discarded, we have little hope of passing this, but we cannot allow 8 resources to accrue on Gollum, so we will give it our best shot. The two cards discarded are East Bight, and Wargs, which means we luck out and pass the escape test. As an added bonus, neither of those cards were ones that we particularly wanted to see. With 4 willpower committed to the quest, and no threat in the staging area, we add 4 progress to stage 1. Before the end of the quest phase, we will trigger Denethor’s ability and see what the next card on the encounter deck is. 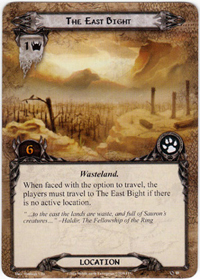 The Heart of the Marshes has an escape value of 1, so Aragorn will have no problem overcoming this. We are getting some much-needed luck in the early game, when willpower is hard to come by. For Gollum’s escape test we will exhaust Aragorn, and after The Heart of the Marshes is discarded victory is a foregone conclusion. With no enemies and nowhere to travel, we move on to the next round. Our new card for this round is Dunedain Mark, which may come in handy if tougher enemies show up, but will wait in our hand in the mean time. For planning we will pay 2 each of Leadership and Lore resources to play Guard of the Citadel and Erebor Hammersmith. There are no attachments in our discard pile, but at this point we are in desperate need of willpower, so the dwarf’s ability is a secondary concern. For questing, we will continue to be aggressive. The last thing that we want to do is dilly dally in a place called The Dead Marshes. Gollum is like a small child that has just gorged on a jar full of honey; he is compliant at present, but any minute now he might transform into a terror that rivals the dreaded Dragons of old. Aragorn, Theodred, the Guard of the Citadel and the Erebor Hammersmith will all commit to the quest. Again, Theodred will give his extra resource to Aragorn, and again the ranger will use it to ready for Gollum’s inevitable escape attempt. The staging step brings us an Impassable Bog. Thankfully, there are no locations in the staging area, and this treachery was created before the designers make everything that has no effect gain surge. So we again avoid any trouble and add 5 more progress to stage 1B. 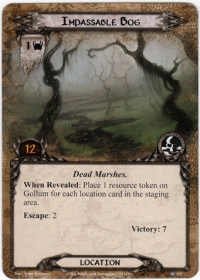 Before we deal with Gollum’s escape attempt, Henamarth is going to take a look at the top card of the encounter deck. With an escape value of 4, A Wisp of Pale Sheen is bad news, so we are going to exhaust Denethor to put it on the bottom of the encounter deck and hope for better luck with our next card. Aragorn exhausts for Gollum’s forced escape test. Doughty though the heir of Isildur may be, no man can long stand the senseless onslaught of babysitting. Never has boredom and sheer terror mixed with such reckless abandon as the task of guarding a small, helpless creature. 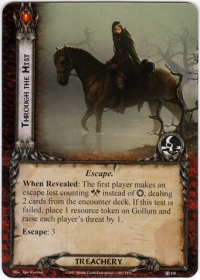 A single mystery card is revealed for Gollum’s next escape attempt and there is a rousing cheer from the troops, and a resigned sigh from Aragorn, as Pursued by Shadow is placed in the discard pile. It hard not to enjoy this early patch of fair weather in our journey, after we just endured that nightmare in the hills. I shudder even thinking about it, and Mrs. Beorn still has not forgiven me for the whole debacle. Who decided Dwarves should be travel agents, anyway? They made their home on top of a Balrog, for crying out loud! They should be the last people in all Middle-Earth to recommend where a bear takes his family on vacation. So be it, that’s enough of my rambling. My stomach is empty, and I’m feeling cantankerous. Consider this fair warning though, next time you are looking for a vacation idea, do not ask a Dwarf. 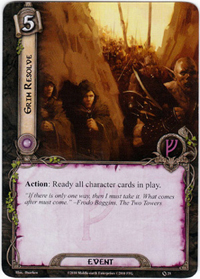 After resources are collected, our new card is Faramir. Glory be! Our luck goes for good to better. We now have a means of boosting our characters’ willpower for the entirety of the quest phase, which happens to work perfectly with a readying Aragorn stuck with the unenviable task of babysitting Gollum. I’m not saying the creature is as bad as a Troll, but there is a definite odor about him. Everyone focuses on my massive paws, understandably, but sometimes having such a sensitive nose is more of a curse than a blessing. In any case, our planning phase consists of saving up for next round. With questing up next, we will maintain our focus on clearing this stage. The faster that we get to stage 2, the less resource token we have on Gollum, the more likely we are to keep the little bugger from escaping into the marshes. We want to try and clear the stage this round, so that we can win the game on our next turn. So Aragorn, Theodred, Gleowine, Henamarth, the Guard of the Citadel and the Erebor Hammersmith will all commit to the quest. Aragorn uses the resource from Theodred to ready and we hope for more good luck. Finally, an enemy is drawn to the sniveling, whining and whimpering that is a constant effluence from the pitiful creature. A Giant Marsh Worm has taken notice of our charge. With 1 threat from the Worm opposing our 7 willpower, we make 6 progress on the quest and easily clear stage 1. We are now on to the last stage of the quest. Assuming we can clear the 3 meager quest points next round, Gollum will make one final escape attempt, and we will have a chance to win the game. Before the end of the quest phase, we will once again use Denethor’s scrying ability to plan for Gollum’s next attempt to run away. The top card of the encounter deck is another copy of The East Bight, which has no escape value, so we are safe to leave it where it is. One of the unintended side-effects of this quest, is that some of the worst cards in the encounter deck can end up being discarded for escape tests. As we are seeing, this can lead to a rather underwhelming experience. Aragorn dutifully exhausts for the escape test, and we discard The East Bight with Gollum still held in check. 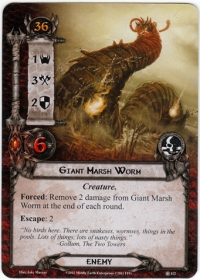 With only 1 threat, an engagement cost of 36, and the annoying ability to regenerate its wounds, there is absolutely no reason to optionally engage the Giant Marsh Worm. If all goes well, we will power through the second stage next turn, and the one threat for this invertebrate should not make one whit of difference. So we will end the round with high hopes that we can be rid of this awful task; though we have not been on this quest long, keeping one eye on the swamps and one eye on Gollum grows riskier by the moment. Drawing what we hope will be our last card, we find Gandalf. Our deck must feel guilty about the disappearing act that it played at The Hills of Emyn Muil, because this game it has delivered perhaps our best four rounds. Before we do anything else for planning, we are going to exhaust Henamarth Riversong to scry the top of the encounter deck. Knowing that Nightfall is coming, makes our choices for planning and questing that much easier. 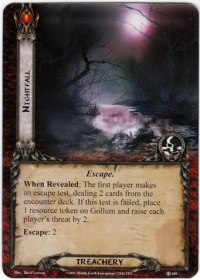 While we could use Denethor to put this card on the bottom of the encounter deck, we are more concerned with the escape test that we need to make after clearing stage 2. With a better idea of what lies ahead, we will trigger Steward of Gondor and use 5 resource from Denethor to play Gandalf. While we would ordinarily use the wizard to lower our threat, we are focused on winning this round, so we will draw 3 cards. Gandalf allows us to draw Strider’s Path, Song of Kings and Protector of Lorien. This is exactly why we wanted to draw more cards. Protector of Lorien on Aragorn will allow us to put the ranger’s readying ability to maximum advantage. For the rest of our planning, we will play Protector of Lorien on Aragorn and play Faramir. Knowing what is coming makes our final quest phase an easy affair. We will commit Aragorn and Theodred, and use the bonus resource from Theodred to ready Aragorn. 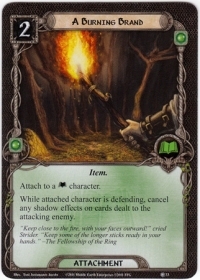 Because we know that Aragorn will be using his willpower multiple times this round, we will go ahead and discard 3 cards to Protector of Lorien: Strider’s Path, Dúnedain Mark and Campfire Tales. Lastly, we will trigger Faramir to give each of our characters +1 willpower until the end of the phase. We know that Aragorn and Theodred have enough willpower to complete this stage, all that remains between us and victory are two escape attempts. Nightfall comes, and with it, Gollum’s first escape attempt. With a current willpower of 6, we will exhaust Aragorn one last time, to corral the terrible urchin. The ranger can now breathe easily, because the Evil Storm and Impassable Bog discarded have a combined escape value of 2. With this escape attempt thwarted, we make 7 progress on the final stage. Thanks to the tireless efforts of our party, we have survived the dreaded Dead Marshes. At the end of our quest, we are rewarded with Gollum’s sudden and inevitable betrayal. We now must make one final escape test, discarding one card for each resource on Gollum. Because we have been vigilant about watching him, Gollum does not have any resources. So we can exhaust all of our remaining characters (with a combined willpower of 15), discard zero cards from the top of the encounter deck, and win the game! With Gollum safely in hand, we can congratulate ourselves on a job well done. It certainly helped that our deck gave us the best dozen or so cards that we could ever want. Perhaps we should rebuild our deck from scratch more often. By playing allies as quickly as possible, and questing aggressively, we never gave the encounter deck the chance to put resources on Gollum. In scenarios like this, the longer that you wait to establish board superiority, the harder it can become to establish. This quest is like fighting a troll, don’t try to dance around and get fancy, punch it in the mouth before it even knows what happened. With Gollum captured, we now look ahead to a long and arduous trip to return the creature to the Elven-King’s halls. That scenario is designed for multiple players, but with our confidence high, we will attempt it using only our trust Leadership/Lore deck. If we can successful return Gollum to his prison in Mirkwood, we will have completed the Shadows of Mirkwood cycle. So join us next time, on a long and arduous Return to Mirkwood. This entry was posted in Beorn's Path, Deck Building, New Players, Playtesting, Strategy and tagged Beorn's Path, Deck Building, Fantasy Flight Games, Living Card Games, Lord of the Rings LCG, New Players, Shadows of Mirkwood, strategy, The Dead Marshes, Tolkien. Bookmark the permalink. Certainly, this was, is, and will continue to be, my least favourite Quest in the whole game. Can’t say I blame you, Landroval. This and Hills of the Emyn Muil can be really frustrating or boring, depending on how the encounter deck draws. In any case, I am looking forward to how the improve these scenarios with the Nightmare decks. I think this is the easiest quest to just blow through in a couple of turns. It had potential, but it is just far too easy and fast. Definitely looking forward to seeing what the Nightmare version looks like. Thanks for another enjoyable session report! Here’s a question for discussion. 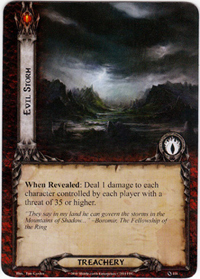 When you have both Denethor and Henemarth Riversong in play, how do you decide which to use first for scrying? Finally, I noted your line “sudden and inevitable betrayal”. If you are a fan of Firefly, then I salute you, sir, as it is a brilliant show and perhaps my favorite TV series of all time. I’m glad that someone get the Firefly reference, I figured that at least one of my readers watched that show. As for Denethor vs. Henamarth, it is a bit of a balance. 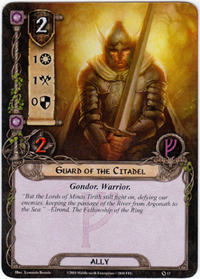 Because Denethor is our best defender, and because his ability lets us actually move the top card of the encounter deck (if we don’t like it), it is usually preferable to use Henamarth first. The idea is to scout with Henamarth, and then, if the next card is going to be a problem, we use Denethor to move it the bottom. This order can be especially important in scenarios like The Dead Marshes, where other effects are triggered after quest resolution (Gollum’s forced escape attempt). If the card that we scout with Henamarth isn’t going to be a problem, we save Denethor for the escape test. Alternatively, if the top card is an enemy, we have saved our best defender to block it, assuming that it will engage immediately. If we did this in the other order, we would never have Denethor available to alter the escape test card, which is the key strategy for defeating this quest. 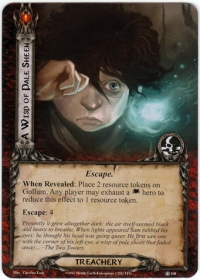 There are some high escape value cards in the encounter deck, and most games it will be very hard to send a lot of willpower to the quest (critical to finishing the scenario quickly) AND the escape tests. To mitigate this we use Denethor before making the escape tests, which greatly improves our odds of passing. Once we got Faramir, these decisions held less importance, because we had enough willpower available that the escape test card was far less likely to make us fail. The scrying strategy makes sense, especially for the Dead Marshes. I think outside of that scenario, my ideal situation in solo play would be having both of them ready after combat, then use Denethor first. That way I can move the card if I don’t like it, scout with Henemarth to see the next one for precise planning in the next round. Oh, I also enjoyed the reference to WWI’s influence on Tolkien’s work. I’ve recently started reading “Tolkien and the Great War” by John Garth which is fascinating! ” .. and this treachery was created before the designers make everything that has no effect gain surge”. Ouch !! As a relative newbie to the game, I’m not looking forward to coming across these kinds of Treachery cards .. when were they introduced ? 😮 I’ve only just completed the Mirkwood cycle, so I’m hoping I don’t have to face these just yet … !